While Helsinki’s startup and hardware capabilities were on display earlier this month at Slush, the world got itself a preview of that prowess when the Eve V campaign for a crowd developed computer took off in mid-November on Indiegogo. The Finnish Windows-enabled design had raised $950,000 from more than 1,750 backers with a month left to go by the time Slush plowed into town, raising more than 12 times their original funding goal of $75,000 at that time. With two days left in their campaign, they have raised nearly $1.34 million. But this is no normal story about an incredible crowdfunding campaign. A small team has designed and manufactured a sleek, new kind of computer. This wasn’t exactly a garage operation considering the money they have received from the Finnish government’s innovation program Tekes as well as monetary and development support from Microsoft, but this is a David to Apple’s Goliath. Interest from Apple users throughout the design phase, and now even making sales to people deep in the Apple ecosystem, should get the tech giant a bit nervous about dissatisfaction with its latest MacBook and other device offerings to long-time loyal customers. Karatsevidis is a young guy, 22, a Greek transplant from Ukraine who studied at Haaga-Helia University of Applied Sciences in Helsinki. From a family with a long-running business manufacturing firefighting equipment, he knows a thing or two about putting together a successful supply chain. They debuted the Eve T1 tablet last year, which went through a more conventional design process before heading off the conveyor belt. This time they decided to ask the users directly. “Everybody creates a product in a vacuum without looking at the end user. Our community has a public working system. They can vote,” Karatsevidis said to us. This is not a normal product for a kickstart team, and as you should expect they don’t have a normal slew of sponsors. They are not only backed by Finnish startup funding house Tekes, but by both Intel and Microsoft, who might be ecstatic right now that their bet is seeing some early interest from Mac users. After five months of back and forth with Intel, Eve got itself a six-figure investment for the project. Intel and Microsoft dedicated a couple of their own engineers to go through and help with the development process. Initially they were selective about was allowed into their online community, which they mysteriously named Project Pyramid Flipper (they were overturning the paradigm, or stacking a lovable dolphin character on top of an Egyptian pyramid, likely the former). They limited access to friends and experts on critical topics, but eventually opened it to more than 1,000 collaborators. This isn’t the first such campaign out of Finland: Cloud-based pocket computer Solu launched their own campaign last year. Solu and Eve put Finnish prowess on full display, but in this case a distinctly Finnish project morphed into an international effort. Finns were comparatively lurkers according to Karatsevidis. About half of the collaborators were American, reflecting what has become their customer base. He also tallies big sales in the UK and Japan. This thing is stacked: IGZO display, 12-hour battery life (! ), Bluetooth, an attachable keyboard and a 7th generation Intel Core CPU. They have quad speakers compared to dual speakers on the Asus Transformer 3 Pro and Microsoft Surface Pro 4. 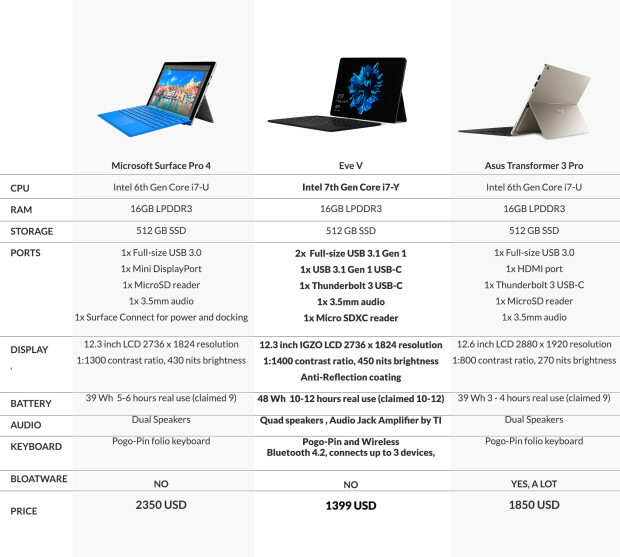 After looking at this chart, one big question is if Eve could easily market to customers interested in the Microsoft Surface Pro or Asus Transformer Pro? While Eve V has many of the same specs, the price differences aren’t quite as wide as Eve markets. Right now, the Microsoft Surface Pro 4 with the same specifications shown here sells on Amazon in the US for $1,739. The price of the Asus Transformer 3 Pro is also a bit less expensive than the above chart, costing $1,615.76 on Amazon. Even though Eve is considerably cheaper, it still lacks the brand name and trust that Microsoft and Asus have. But its lack of bloatware and affordability is a big selling point against Asus. All that said, Eve V’s detachable keyboard could intrigue buyers of another big name computer: Apple’s MacBook. Turning the MacBook into apple sauce? A quarter of the community’s visitors came from iPhones and other devices, something viewable in analytics and the surveys they gave new collaborators. They have not surveyed backers yet, but want to considering the amount of hype around their possible Apple masher device. One of the issues reviewers have noted is MacBook’s shortened battery life of six-seven hours as opposed to the advertised 10. If Eve V sticks to its 12-hour promise, that’s a big win for their small operation and for Microsoft. Among other concerns like graphics card issues, Apple’s persistence with Thunderbolt might be the biggest. Frustration over a lack of ports leaves the field open for Eve V, which has two USB-A 3.0 ports, a USB-C, and a Thunderbolt 3, meaning it embraces the style and expected performance of Apple as well as the old and new of connecting other devices to the computer. Before the campaign launched, some users suggested creating a trade-in/exchange system for MacBook users, something they could not agree to with their need to raise capital (credit card fees, manufacturing costs, and a 5 percent fee for Indiegogo). Karatsevidis says the astounding battery life is a result of “over-investing in everything” in the short term and cost-cutting in the long term. They will only sell online, and were sure to give accessories to early birds instead of radical discounts on the device. The main challenge was sourcing the components and preparing for the manufacturer’s run, where Karatsevidis says most crowdfunding campaigns fail. That’s why the initial design still took another year to reach Indiegogo. “The reason it took 12 months was we had to double and triple-check every decision we made with manufacturers in China,” and it was often times not possible to go with an initial plan for a part or assembly. The drawing board got a lot of return visits on certain components to make sure their deal with their Shenzhen manufacturer went smoothly. The year-long delay did not massively effect the design. Asked by Geektime if anything became outdated, Karatsevidis iterated that many components like type panels for basic computer design rarely see a dramatic shift. The only thing that changes at a steady rate is the processor, and that can easily be switched out for the market’s latest. One of the areas where capital becomes important is the display, which usually requires a huge volume commitment or huge cash commitment to close a deal with a manufacturer. Eve Tech has 24 employees and external engineers from investors. They keep an office in Helsinki with team members in Stockholm and China. The first 500 Eve V computers should go out by the beginning of March. It is not “a.k.a. Eve 5”. The V only stands for the “flipped pyramid”, not the roman numeral. I should know, I came up with the name.